Want a multi-day pack but don't want excess weight? 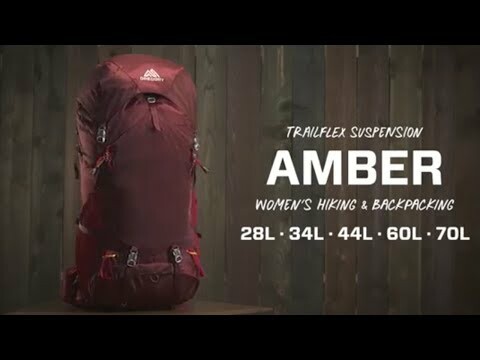 Light for its size, the Amber 70 is the go-to pack for women looking to cover ground. Utilizing Gregory’s Trailflex suspension system, the harness and hipbelt are fully adjustable and use multi-density foam to put padding where you need it most. Attachment points on the front and lid let you rig a solar panel to collect energy as you cover ground. If the forecast is wrong, don’t worry, the integrated rain cover will keep your pyjamas dry even in wet weather. Made of lightweight, durable ripstop polyester with stretch nylon in key areas. Trailflex suspension is lightweight, supportive and comfortable. Contoured hipbelt is padded with multi-density foam and adjusts up to 15cm for a custom fit. Top access and bottom zippered sleeping bag compartment make packing and unpacking quick and easy. 2 side water bottle pockets compress when not in use, so they won’t snag on branches or rocks. Daisy chains on lid and front are ideal for holding a Goal Zero Solar Panel (available separately).